Whether you’re looking to hire, looking for a new career, or just want to know what we’ve been up to, the Greene Resources blog has the information you need to get started. In an employment market where talent is scarce, and unemployment is low, most candidates for open positions are already working at another company. One of the most common obstacles that can arise after making an offer to a candidate are counteroffers from their current employer. Here are ways to address (and prepare for) counteroffers. Discuss potential counteroffers with the candidate early in the interview process. The best way to prevent being blindsided is to be prepared. Ask candidates what they would think, say, or do if they were presented with an ideal counteroffer package from their employer. This can help clue you into the candidate’s mindset, while also preparing the candidate to address a counteroffer if and when it comes. Stay in touch with the candidate immediately before and after their resignation. Leaving an employer for a new opportunity is an emotional experience, where the candidate may be saying goodbye to valued mentors and friends. Knowing they have a trusted partner and advocate on the other side who is ready to help them embrace a new opportunity will make it easier for them to cut ties. Ensure your own offer meets all of the candidate’s needs and motivators. Money may be a main motivating factor for a lot of candidates, but it is likely not the only factor they are considering. Many candidates are looking for non-traditional benefits, such as flexibility in how and when they work. Stay in tune with what your candidate values and ensure you are meeting their needs and expectations. Even after following these best practices, the decision of whether or not a candidate will accept a counteroffer ultimately lies with the candidate. If your team needs help managing the search for talent or if you are looking for guidance on how to work with candidates who are receiving multiple offers, we want to help. Greene Resources has over 18 years of experience working through the hiring and onboarding process with companies of all sizes and we would love to hear how we can make an impact on your business. 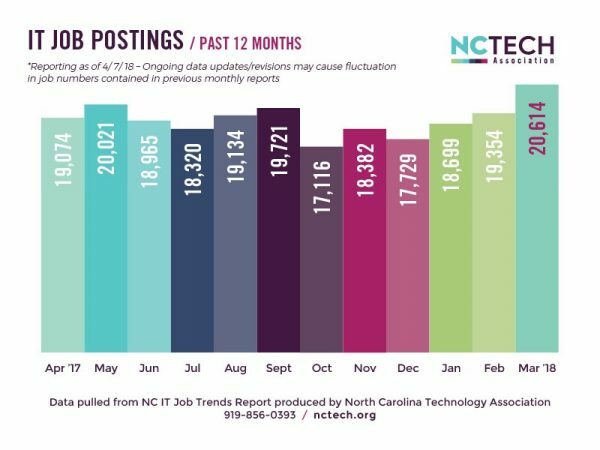 Greene Resources is partnering with NC TECH in 2018 to deliver a monthly IT Job Trends in North Carolina report. This report provides a snapshot of the environment for tech employment in North Carolina using the TalentNeuron tool from Gartner, the world’s leading IT research and advisory firm. Readers can view the number of IT job postings presented in various top ten lists (skills, jobs, employers, regions) as well as a rolling 12-month chart reflecting the trend in job openings over the previous year. View the April 2018 report reflecting March’s hiring numbers. Greene Resources was the presenting sponsor of the Greater Raleigh Chamber of Commerce Women’s Professional Luncheon on April 9. This luncheon featured a panel of local experts discussing how to negotiate at work. The panel included Dawn Ohaver Moyer, co-founder of Potential Essential; Amanda Owens, Vice President, Head US HR Advisor Desk at Credit Suisse; and Shannon Ralich, Contracts Attorney at Eaton. Before scheduling or entering into a negotiation, you need to be armed with data. If you are planning to extend an offer to a candidate, understand the salary range and other benefits available to the candidate, but also understand from where those numbers come and how they relate to the local employment market. If you are a candidate preparing to negotiate a salary or a current employee planning to ask for a raise, understand what the average market rate is for your position and expertise. At the end of your research, you should write down the a) best possible outcome, b) compromise, and c) worst case scenario. Having a full understanding of the topic you are discussing will make you more confident and will allow you to be more strategic regarding what you plan to ask. To feel more confident when negotiating, practice negotiating on smaller, less important things throughout the year. Whether it is something insignificant – like going to a restaurant or choosing a movie with your friend or significant other – or something meaningful – like getting more flexibility in your schedule once a month to go to your child’s extracurricular activity – practicing how to negotiate to get the best outcome possible will help you feel more prepared when you need to negotiate for something more significant. When preparing and researching, keep in mind the person with whom you will be speaking. How do they best receive and interpret information? Would they prefer a bulleted list of facts and figures or would they rather be told a story? Will they need a heads up a day in advance or will they feel comfortable speaking to you off the cuff? When going through your talking points, think about how they will counter what you are saying, and what you can say in response to their concerns. By understanding how they like to speak and receive information, you will set yourself up for greater success. Too often, people associate negotiating with being tough, severe, or cold. Remember that the goal of the negotiation is not necessarily to get your way, but to get the best possible outcome while still preserving your relationship with the other party. You do not have to betray your personality to be a strong, professional negotiator. Understand what you bring to the table and know your strengths, but also acknowledge your weaknesses and come up with an action plan on how to deal with the areas where you may struggle. It is so easy to pretend to listen to someone while you are just waiting for your chance to speak again. This is not an effective negotiation tactic. Negotiating has very little to do with you and much more to do with the other party and their needs. Your goal should be to understand how their needs mesh with your own and where to find the best solution for each of you. To accomplish this, you need to truly listen to the other person and ask questions based on the information you hear. Additionally, what you hear may be new information that changes what your needs or desires are. If that happens, be willing to change your stance based on this information. Being willing to adapt to new information will build trust and credibility with the other person and will make them more open to meeting your needs. At Greene Resources, we regularly see the need for effective negotiation when it comes to finalizing a job offer between an employer and job seeker. Working with a recruiting firm provides both parties a mediator of sorts so that the best possible outcome is reached for everyone. If you’d like to learn more about how to negotiate at work, whether for extending an offer or accepting a new role, we’d love to partner with you. View the March 2018 report. Over the past year, Greene Resources has added to the Greene Team by 17 percent. Due to this rapid and continued growth, we have recently expanded our Raleigh headquarters by an additional 2,000 square feet. We are thrilled to have more space for our team to work, collaborate, and meet with our candidates and clients. If you have not had a chance to stop by our office to see the new space, please feel free to review our virtual tour of the space below. Our interview rooms provide a quiet and informal space for candidates and recruiters to connect and discuss our open positions. 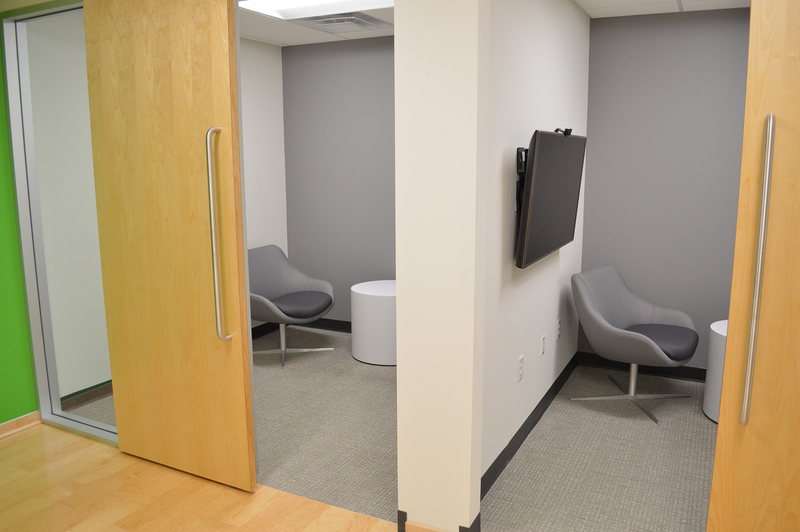 These rooms also double as “huddle rooms” for our internal team to meet one-on-one to discuss projects in a more private setting. 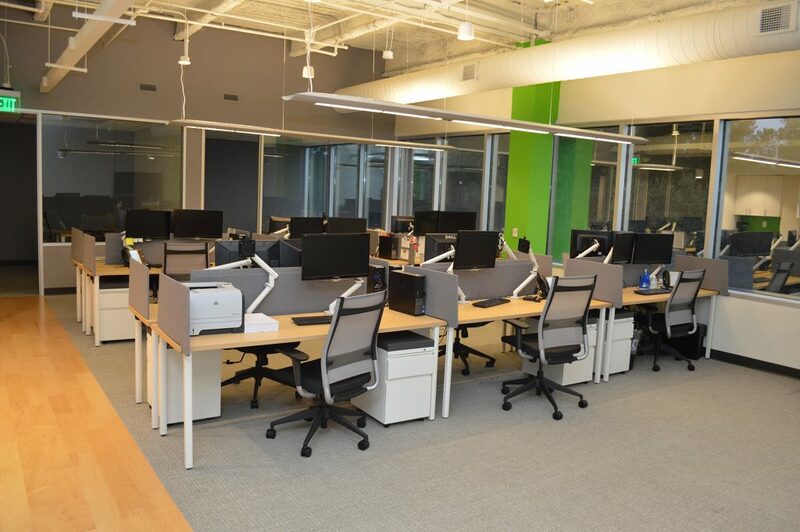 Our open environment continues in the additional space, allowing our team to collaborate and easily connect with each other, ensuring effective, efficient, and timely communication. 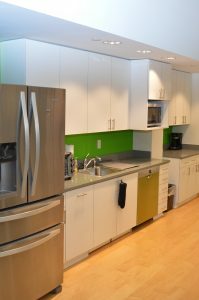 Common areas include operations, our kitchen, and a recreational area, allowing our employees to “choose their own experience” in where and how they work. The Greene Team is a competitive group of people, which inspires excellence when serving our customers, but carries over into our free time as well. 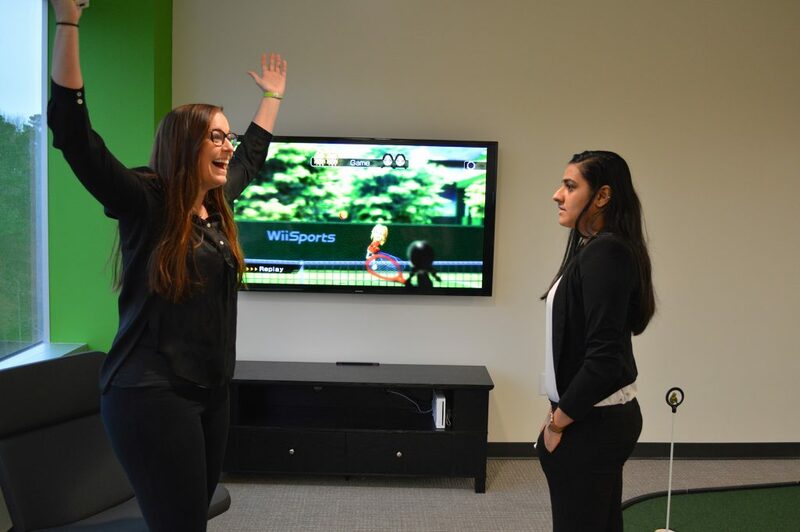 Our employees experience a gamut of emotions when competing on our Wii console, including the thrill of victory and the agony of defeat! 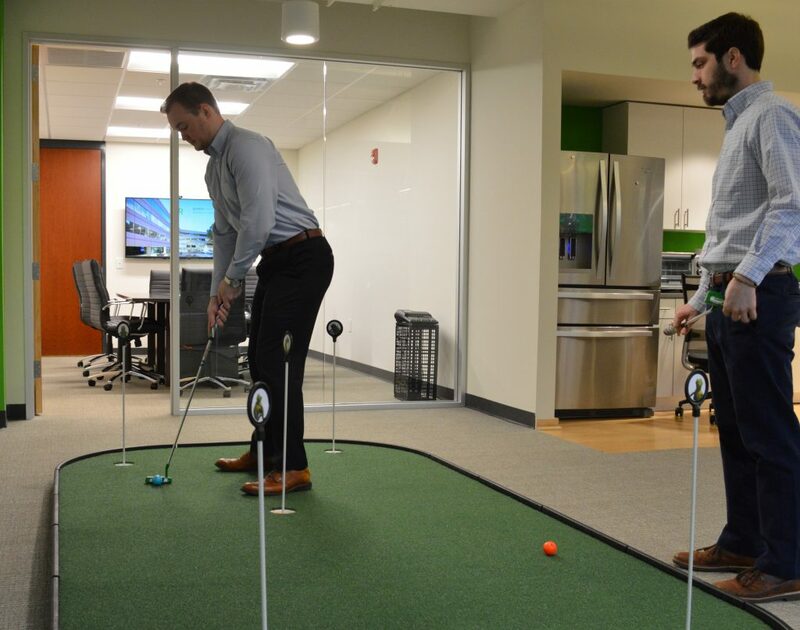 For those interested in playing golf on a putting green instead of a gaming console, our new space offers an opportunity to do both. In their free time, the Greene Team works hard to improve their short game on the green. At Greene Resources, everything is done with purpose and our work environment represents and reflects our commitment to deliver purposeful talent solutions. 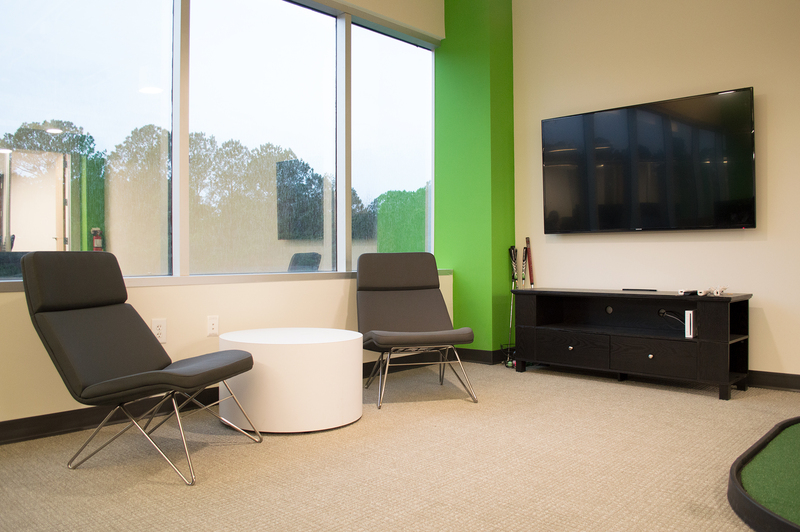 Every workspace, every conference room, and even our break room was thoughtfully designed with everyone’s best interests at heart. If you would like to check out our office in person, feel free to swing by! What’s New In Triangle Hiring? Wake County Economic Development, the City of Raleigh, and Capital Area Workforce Development Board recently partnered to survey 15 counties surrounding the Triangle to identify areas of growth and skills needs in our region. This survey was conducted by one of our partners, RTI International, and its distribution and efforts were supported by close to 50 local organizations. On February 13, the results of this survey on Triangle hiring trends were shared along with solutions that currently exist, challenges that need to be met, and opportunities that exist to create stronger partnerships in the area. Continued Business Growth: 73% of companies surveyed expect to grow within the next three years. Industries that were most likely to grow in this region include construction and skilled trades, life sciences, and IT, software, and analytics. Many of the companies that expect to grow are small businesses with fewer than 100 employees, but expected growth was maintained across company sizes. Business growth is not limited to lower level positions; companies are looking to add supervisors, managers, and other skilled positions to their business. Quality of Talent: Across the region, businesses rate the talent in our region as above average – 3.14 out of 5 stars. Businesses in STEM tend to rank talent as a 3.4 or higher, demonstrating a higher satisfaction than other industries in the talent they have. Businesses in the hospitality or construction industries demonstrated a lower satisfaction rating regarding their talent pool. Education Requirements: Close to half of all businesses reported wanting talent that had a college degree. Other industries, like manufacturing and construction, emphasized a greater importance in having professional certifications or an apprenticeship instead of a four-year degree. Tools and Resources for Sourcing Talent: The number one resource for most businesses in locating talent is networking and internal referrals. While networking and referrals remain a strong tool for businesses to hire employees, it is not as effective for businesses who place a high emphasis on the importance of diversity in their employees, as internal employees tend to refer friends or connections who are like themselves regarding age, gender, race, and personal interests. Valued Soft Skills: The top three valued soft skills that businesses reported as lacking in their talent pool include taking initiative, critical thinking, and self-discipline. Hiring Challenges: Major hiring challenges in our region include 1) a rapidly growing industry need that is outpacing the supply of talent in that field, 2) an interest gap in manufacturing or skilled labor, where there are fewer people interested in entering that field, 3) employers seeking skills that the talent pool simply does not possess, 4) businesses want educators to make their courses relevant, but educators do not always have the necessary industry skills to do so effectively, and 5) the talent pool for mid-tier positions have a lack of professional experience for the roles that need to be filled. Apprenticeships/Internships: Businesses regularly express the importance of their talent pool having experience in an apprenticeship or internship, however, most businesses do not plan to or do not currently have an apprenticeship or internship program in place. Triangle hiring continues to grow and there is a high demand for qualified talent. The Triangle is a great place for career growth and there are ample opportunities for job seekers to find new roles, and according to this report, is also a great region to obtain talent, specifically in STEM fields. Nevertheless, businesses need to begin to take ownership of providing training and resources to their prospective and current employees, both while they are employed and through partnering with schools and colleges in the area. Providing opportunities for apprenticeships, internships, or contract roles will give workers a chance to develop the soft and technical skills so coveted by local businesses. At Greene Resources, we are always looking for new ways to connect job seekers with employers to create purposeful, impactful, and long-term careers. If you’re looking for creative solutions to your hiring challenges, we would love to discuss them with you to see how we can help your business, and our region, grow and thrive. NC TECH recently released their annual North Carolina State of Technology Industry Report (STIR), which provides an overview of the tech sector in North Carolina and contains trends, statistics, details, and predictions regarding the industry’s development in our state. On February 7, 2018, NC TECH held their annual NC STIR Briefing. Ted Abernathy, Managing Director for Economic Leadership, presented the highlights and key findings of the report. The full report can be accessed here. Here are some of the highlights from the briefing. The United States has experienced 88 consecutive months of employment growth, the longest length of experienced growth on record. This trend has begun to slowly decline over the past three years, so a change in the job market is likely to happen in the near future. North Carolina has outperformed or maintained the national average for employment growth for the past three years. The low unemployment rate is great news for job seekers but makes it difficult for businesses to find the talent that they need. In 2016, the tech industry employed over 247,000 people and was worth $82 billion in sales revenue in the state of North Carolina. Technology accounts for 5.8% of all jobs in the state, but almost 11% of the state’s total wage earnings and sales. North Carolina is the #1 state in the nation for having the highest percentage of its tech workforce made up of women (36.5%). Tech employment is estimated to grow 10.4% from now until 2022 in North Carolina, ranking NC the #2 state in the country for highest expected tech sector employment growth. In the past five years, North Carolina has demonstrated the 3rd highest job growth rate in the tech sector nationwide, at a rate of 17.4%. The national average is 7.7%. North Carolina ranks 4th in higher education research and development in science and engineering. Given all these numbers, rankings, and statistics, a few things remain clear. First, the technology industry continues to accelerate at a rapid pace, particularly in places like North Carolina. Second, low unemployment rates combined with rapid growth have made it more difficult than ever to locate talent for all kinds of positions, but especially in the technology industry. For job seekers looking to enter or grow in the tech sector, there are few places better to live than North Carolina to accomplish this goal. For businesses, North Carolina continues to prove itself in being a great place to grow and thrive. Whether you are a job seeker looking for your next role or a business looking for that next star performer, Greene Resources would love to be part of your journey. Join our Talent Network to see our current list of openings or send us a message about your next project so we can see how we can help. 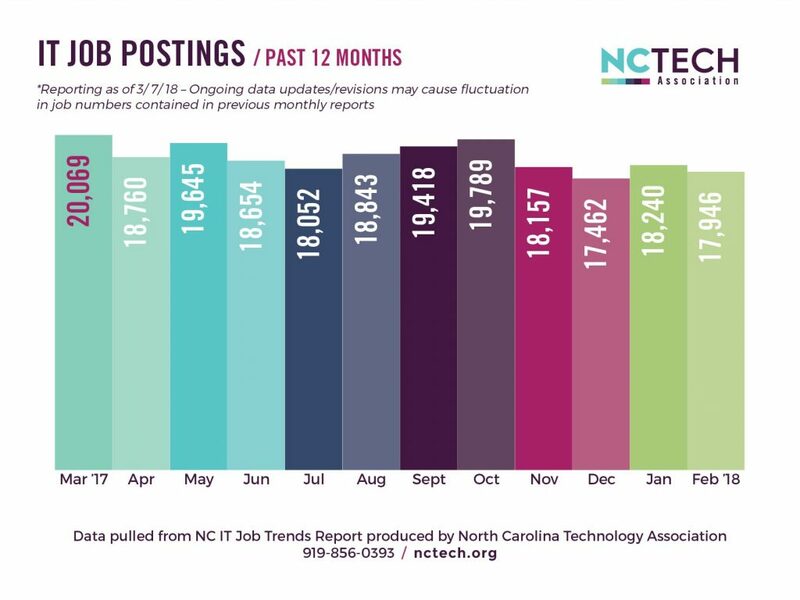 If you’d like more information on tech talent trends in North Carolina, Greene Resources has partnered with NC TECH in 2018 to share monthly reports on current hiring activity. Check out NC TECH’s website to view the most recent reporting. Greene Resources was the presenting sponsor of the Greater Raleigh Chamber of Commerce Women’s Professional Luncheon on January 22, which featured a panel of local experts discussing how to successfully manage and develop emotional intelligence (EQ) in the workplace. The panel was moderated by Wendy Gates Corbett, president of Refresher Training, LLC and included K. Melissa Kennedy, founder of 48 Innovate; Heather Lee, senior partner of Developmental Associates; and Mary Tomlinson, president of On-Purpose Partners. Now more than ever, hiring managers in most industries are looking at individual’s emotional intelligence as part of their interview and hiring process. Managers are interested in finding candidates who can not only perform the duties of their role, but also possesses soft skills, like effective communication, empathy, and self-awareness. Defining emotional intelligence: Emotional intelligence (EQ) is essentially understanding and managing emotions effectively in order to better build relationships with those around you. EQ in your personal life: Take the time to reflect on your own emotions and how you manage them. When faced with an unexpected or unpleasant situation, do you react, or do you respond? Responding to a situation involves self-awareness and understanding the situation from a holistic perspective, while reaction is a gut instinct that focuses on yourself and how the situation exclusively impacts you, not those around you. By being mindful of your own feelings as well as the feelings of others, you can learn to respond appropriately to negativity or frustration. EQ as a leader: The days of “leaving your emotions at the door” are over. Effective leaders today understand that emotions are intrinsic to who you are and who your employees and customers are. Instead of focusing exclusively on data, facts, and analysis, leaders should also focus on how their customers and employees think, feel, see, and do. Include EQ in your recruiting process: There are a multitude of validated assessment tools and interview questions that can help your team determine a job candidate’s EQ. Your interview process should not include many “yes/no” questions; encouraging candidates to expand on their experience will help you get a clearer picture of who they are and how they may fit in your business. Studies indicate that IQ and cognitive abilities only account for around 30% of a new hire’s success at their company, with the remaining 70% dedicated to soft skills and their ability to work with others. Ensure your organization’s culture prioritizes emotional intelligence and provides regular training, assessments, and workshops to ensure your team is regularly developing their EQ. Practice empathy when communicating: When communicating with others, take the time to listen and ensure you fully understand the other person’s position before providing your own opinion. If you are not clear with others when communicating, the other person or people involved in the conversation are going to fill in the gaps of the conversation with their own interpretation, which is likely different from what you meant. Whether you are introverted or extroverted, communication is a skill you develop, not intrinsically tied to your personality. Determine where there are typically gaps in your communication style and work to achieve clarity and establish an action plan at the end of your conversations. Communicating with others is one of the first things we learn how to do in life, and can be one of the hardest things we do. Developing self-awareness, practicing empathy, and taking the time to understand your emotions and the emotions of those around you will make you a better leader, employee, coworker, friend, partner, or parent. At Greene Resources, our mission every day is to put people first by taking the time to understand the needs and goals of our clients, job candidates, and employees. We would love to hear how we can help you achieve success and meet your goals. The Greater Raleigh Chamber of Commerce held their annual Economic Forecast on Wednesday, January 3. This event provides a glimpse of what economic and hiring trends in 2018 we can expect to see locally, nationally, and internationally. The Economic Forecast was hosted by David Crabtree, anchor at WRAL-TV. Presentations were given by Mark Vitner, managing director and senior economist at Wells Fargo, and Mark Yusko, founder, chief investment officer, and managing director of Morgan Creek Capital Management. Mr. Vitner discussed the upcoming national and local trends to expect within the economy and Mr. Yusko provided insight on the global economy and how that will change over the next year. Both Mr. Vitner and Mr. Yusko provided extensive data and analytics in their discussion, including several areas in which they disagreed. Below is a brief overview of the conversation. View Mr. Vitner’s presentation here. Economic Growth: Real GDP growth accelerated during the second and third quarters of 2017. The improved pace of growth appears to be carrying over in 2018. Growth is not only stronger but much more broadly based. Growth will cross into new regions outside of metropolitan areas, as evidenced by housing starts. Tax Reform: Corporate tax cuts have finally become a reality. This will probably impact the way businesses strategize for the coming year. Expect consumer spending and business investment to grow along with increased spending on infrastructure at the local level. Rates & Trends: The post-financial crisis era is over. Monetary policy is now focusing on normalizing interest rates and financial regulation. Mr. Vitner expects the Fed to raise interest rates three times in 2018. North Carolina Impact: North Carolina’s economic recovery gained considerable strength during the past couple of years, although gains have largely been limited to the Triangle and Charlotte. Growth is now broadening to include most metro areas. Expect another 25,000 jobs to be added to metro areas and their outlying regions. View Mr. Yusko’s presentation here. Economic Growth: Efforts to generate growth through tax reform, fiscal stimulus, and other methods will likely be unsuccessful due to an aging population. Efficiency will continue to decline as a result of baby boomers aging out of their most productive years (ages 45-65). Tax Reform: The recent tax reform legislation will continue to perpetuate income and wealth inequality within the United States. Businesses are optimistic regarding tax cuts, but Mr. Yusko likens these tax cuts to those of the early 1980s and anticipates higher taxes within eight years. Rates & Trends: Despite positive rhetoric regarding the economy, actual GDP growth has been moderate at best, and job growth is beginning to fade. Mr. Yusko predicts the value of the dollar will fall, the increase in the deficit will lead to lower economic growth, and it seems like interest rates will not rise as much as expected. International Impact: Economic growth is most clearly seen in countries with a developing economy; China, South Korea, and India are all on the rise. As shared by the speakers, the timeline for continued economic growth is certainly debatable. Something on which both speakers agree, however, is the vibrancy of the Triangle. The Triangle continues to grow twice as fast as the nation. The Triangle continues to benefit from affordability migration, a trend in which people are leaving larger, more expensive cities for more affordable, mid-tier cities. From Greene Resources’ point of view and from a hiring standpoint, the Triangle economy fairs well for the job seeker. Indeed.com recently completed its 2018 Employer Outlook Survey to find that 90% of recruiters expect to hire at least the same amount if not more people as they did in 2017. With both the North Carolina and the national unemployment rate at close to 4%, and the Triangle unemployment rate hovering around 3.6%, businesses will be faced with fierce competition to locate and land talent for their team. When it comes to competing for those job seekers, success will likely be determined by the employee experience. A recent Gallup survey of job seekers showed that competitive pay and benefits are still important, however, it is also important for employees to clearly see where they fit in the company, where they can grow, and how the company will help them learn and develop. When it comes to locating the best talent for your company, we believe connecting with Greene Resources will help ensure continued success. Want more information on economic and hiring trends in 2018? Watch the 2018 Economic Forecast here. Ensure Your Compensation Strategies are in Line with the Market. When was the last time you looked at the average market value of the positions on your team? If you do not have up to date data on your team’s positions, consider asking us to run a workforce data report (for free!). These reports provide tangible data to help ensure your team’s salaries are realistic with your budgetary constraints, but also in line with the market. Talk to Your Team about Upcoming Goals. According to analytics from LinkedIn, more people change jobs in the month of January than any other time during the year. If you’re hoping to prevent turnover or improve retention, have a “year in review” debrief after the holidays. In these debriefs, you can discuss personal and team goals, past accomplishments, areas for improvement, and where your company anticipates going in the coming year. Employees who understand their value and see a future at your business are more likely to be dedicated employees who are engaged in their work. The hiring process takes time and if rushed can result in an unsatisfactory hire. Make sure to prioritize interviews with potential new hires and take the time to follow up appropriately with candidates. If the process takes longer than you may think, Greene Resources can provide contract support staff during unexpected personnel shifts or company growth, helping your company stay on target while ensuring you find the right person for a new role. No matter how prepared you try to be for hiring in 2018, unexpected personnel changes will occur. Having a trusted partner who can help you navigate these changes and provide resources, guidance, and advice can help prevent additional anxiety or stress and can help you make the right decision. Greene Resources has spent the past 18 years providing guidance to local businesses in all types of unexpected circumstances. If you find yourself facing an unexpected situation in your company and need talent, advice, or a plan, please let us know.